If you’ve recently updated your computer to Windows 10 – or plan to soon – there’s an important security setting called Wi-Fi Sense that you need to know about. 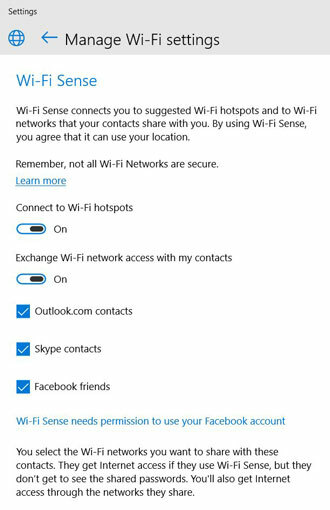 The new operating system can share all your private Wi-Fi network passwords (in encrypted form) with all your Outlook and Skype contacts as well as your Facebook friends if you opt in and allow it to. These contacts won’t know what your password is, exactly, but should they bring their Windows 10 laptop over your house, it’ll connect to your home network automatically. While many will no doubt find Wi-Fi Sense to be useful, there are a handful of security concerns to the feature — especially if a "friend" uses it and exploits your connection for malicious purposes. Wi-Fi Sense stores Wi-Fi network usernames and password information on a Microsoft server, leaving the information at risk of a future data breach. And, of course, enabling Wi-Fi Sense on your own computer means you could accidentally and automatically connect to malicious public networks. If you share these security and privacy concerns, you can disable Wi-Fi Sense by entering Settings > Network & Internet > Wi-Fi > Manage Wi-Fi Settings. Microsoft Windows 10 is currently a free upgrade for all Windows 7 and Windows 8 PC owners. Be sure to check out our overview of the new features waiting in Windows 10. To learn more about the upgrade process, check out our Windows 10 upgrade need-to-know guide. And don't miss reading up on these 5 key Windows 10 privacy and sharing settings you need to change.